We live in the era of the reboot. Forget movie reboots — we’re talking about phone reboots. BlackBerry’s still launching phones with hardware keyboards, Nokia is back from the dead, and now we may be treated to a reboot of the Palm. According to the latest report from Android Police, a device called the PVG100 by Palm Venture Group (which is now owned by TCL) filed with the Federal Communications Commission last week. 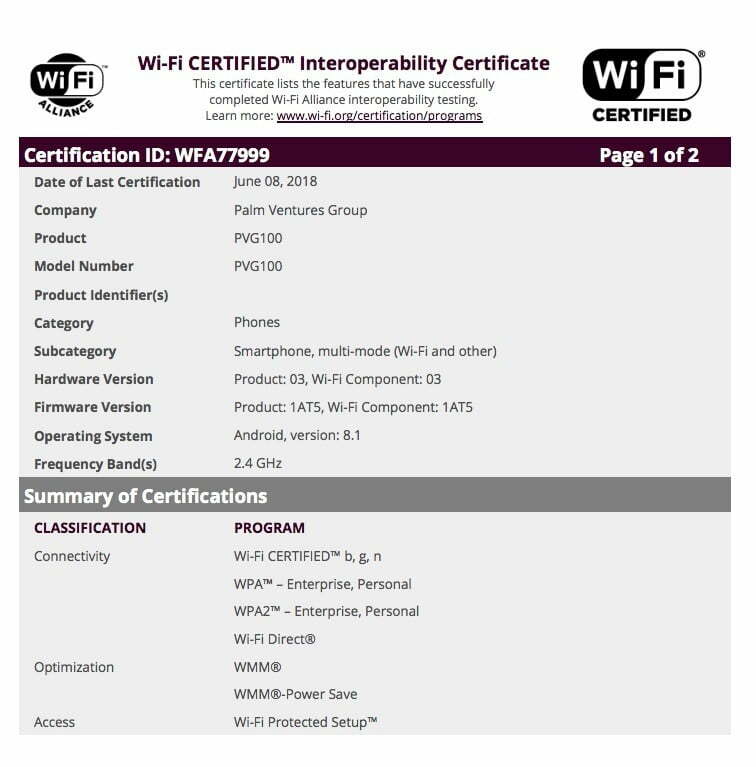 In June, it also passed through the Wi-Fi Alliance certification program. In March, Android Police broke the story that a new Palm device may launch on Verizon in the second half of this year. The rumor, which cites an anonymous source, echoed rumors that were sparked last year when a TCL executive confirmed that the company wanted to launch a Palm device in 2018. Seeing as how we’re already a little more than halfway through the year, there’s not much time left to release the device. While the latest filings don’t give too much detail, it does state the device will run Android 8.1 Oreo and lists 2.4GHz as the frequency band. This means the PVG100 won’t have support for 5GHz. It will be interesting, though not surprising, to see an Android-powered TCL phone. Not surprising because recent BlackBerry phones have also featured the Android operating system, but interesting because Palm may want to load on some of its own software tweaks. TCL seems to be building a reputation as the company that revives old smartphone brands, despite otherwise being known for its TVs. TCL is also the company behind the recent BlackBerry revival. While it is popular, the Palm brand doesn’t necessarily hold as much weight as BlackBerry or Nokia, so it will be interesting to see how the company can effectively market a new Palm device. Of course, Nokia does seem to have done pretty well for itself so far — the flagship Nokia 8 Sirocco is well-designed and features some pretty nice flagship specs, like the Qualcomm Snapdragon 835 and 6GB of RAM. It does make sense that Verizon would be the company to carry the newly revived Palm. Verizon intended to carry the Palm Pre 3, a phone that was canceled by HP, Palm’s then-buyer, before the phone could be launched in the U.S.